A quick and easy vegetarian and vegan eggplant marinara recipe using soy milk and egg replacer. 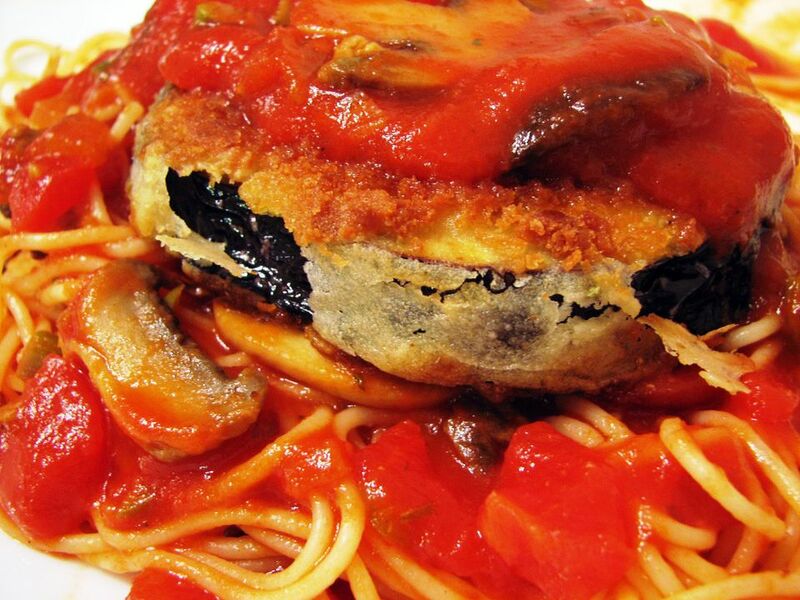 Eggplant is breaded, baked, and topped off with marinara sauce and fresh chopped basil. Slice eggplant into 1/2-inch thick rounds, then sprinkle well with salt. Allow to sit for at least 20 minutes, then rinse and gently pat dry. Whisk together the soy milk and egg replacer in a small bowl or shallow pan. Set aside. In a separate bowl, combine the bread crumbs, Italian seasoning, and salt and pepper. Place the flour in a third bowl or shallow pan. Lightly dredge the eggplant rounds in flour, and gently tap of any extra. Then coat well in the egg replacer and soy milk mixture. Next, coat well with breadcrumb mix. Serve your baked eggplant topped with marinara sauce and chopped fresh basil, if desired. Makes four servings of breaded and baked eggplant marinara.